Her subjects are primarily Birds, Wildlife, Florida Landscapes, Children on the Beach, Lighthouses, and Covered Bridges. The mediums for her paintings are acrylic, watercolor, and colored pencils. She uses her own extensive collections of photographs as reference for her paintings. Custom paintings are available to the clients specifications. For many years, she sold her art in shows with her husband, Robert Williams, a full time Watercolorist, Deceased in 2004. She has participated in the Federal Duck Stamp workshop and contest, placing in 1999. 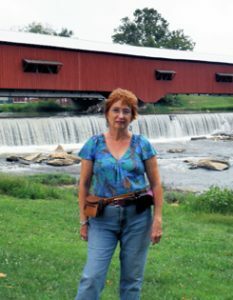 When in Indiana she lived and painted in Parke County, which is known as “The Covered Bridge Capital of the World.” She is a member of the Covered Bridge Art Association, owns property there, and participates in the annual show October 14th to 23rd. She will be displaying her art at other art shows in Florida. She accepts commissions to do portraits, and other art to your specific requirements. She has been the owner of Art and Rugs by Design since 2005. She designs custom art, custom rugs, and carpets for designers, stores, and for manufacturers. Graduating from Lipscomb University with a Bachelor of Arts, she majored in Art, with a minor in Interior Design. She took graduate classes at Middle Tennessee State University, and received a Master of Science degree in Art from Indiana State University. After college she was the corporate interior designer for MAB Paints Inc. in Indiana. Moving to Florida in 1986, where she held the position for seven years with Robb & Stucky Corporate as buyer for Window, Wall, and Floor Products in Fort Myers, FL. She managed Designer’s Rug Center in Naples, Florida for 11 years and has been living in Land O Lakes since 2004, where she started her agency in 2005. 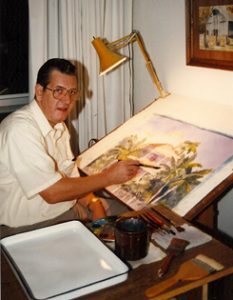 Robert F. Williams, 1944 to 2004, captured the many moods of Florida in his subtle renderings of birds, native architecture, lighthouses, Key West style homes, boats, and lush tropical landscapes found throughout Florida and its surrounding islands. His images are featured in many commercial settings in Florida, including model homes in master-planned communities, Sarasota Memorial Hospital, H.C.A. Blake Hospital in Bradenton, furniture stores, interior design studios, and Palm Beach County Aids Clinic. Many private collectors also treasure his paintings. Williams attended Indiana State University majoring in Fine Art, and was an Indiana Covered Bridge artist in scenic Parke County. He was a resident of Tampa then Naples, Florida from 1986 until his death of heart disease in 2004.